Ask any Odia to name one dish that satiates the soul like no other and in all likelihood, pat will come the reply - Pakhala (pronounced as Pa-khaa-law)! Pakhala Bhaata (or fermented watered rice) is something that Odias can't do without. It is as much a part of our cultural identity as the Puri Jagannath Temple. Relished by both the poor and the rich alike, it has been an integral and inseparable component of an average Odia's diet since time immemorial. In fact Lord Jagannath's Chappan Bhog (the list of 56 delicacies that is offered to him as prasad) at the Puri temple includes Pakhala - Dahi Pakhala and Ada Pakhala are offered to Him every day, thereby implying that Pakhala dates back to the 10th century AD. Since the last few years, Odias the world over have been celebrating "Pakhala Dibasa" or "Pakhala Day" on 20th of March, in honour of the humble dish that is unique to the state. On this day, the members of the Odia community can be seen enthusiastically preparing a pakhala spread and inviting their friends over to share their joy. There couldn't have been a more apt date for "Pakhala Dibasa" as co-incidentally, 20th of March is also celebrated as International Day of Happiness. What could be more blissful on a hot, summer day than slurping on a bowl of Pakhala? For us Odias, come summer and we fall back on this choicest summer cooler of ours - Pakhala - to keep ourselves hydrated for long and thus safe from sun strokes and nausea. A bowl of Pakhala beats the summer heat like no one else! This humble food item has immense health benefits. It is undoubtedly one of the easiest and a sure shot way to keep our digestive system in order during the hot weather extremes. 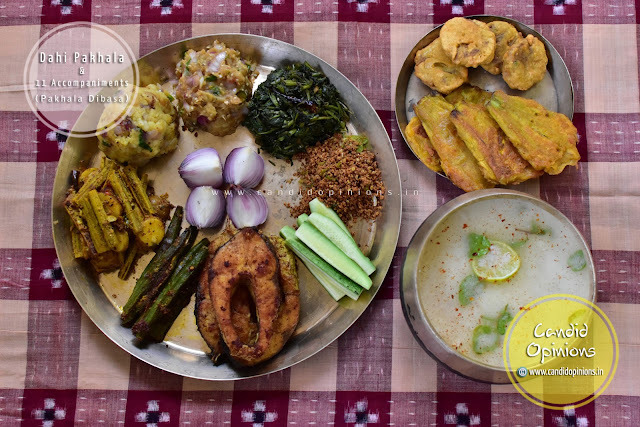 With this Pakhala spread, I wish all my fellow Odias a very Happy #PakhalaDibasa. The accompaniments for this Dahi Pakhala include: (starting from top left going clockwise) baghara alu bharta (mashed potatoes seasoned with condiments like chopped onions, green chillies and panch phutana), baigana bharta (smoked brinjal mashed with choppd onions, green chillies, mustard oil and finely chopped coriander leaves), kalama saga (water spinach stir-fried with red chillies, crushed garlic and 5 spices - panch phutana), badi chura (crushed badis mixed with mustard oil, garlic, grounded green chillies and salt), kakudi (cucumber), rohi macha bhaja (fish fry), masala dia gota bhendi (okras stuffed with grounded garlic, red chillies and mustard paste), chuin alu bhaja (drumstick pieces cooked with potatoes, tomatoes and other spices) and piaja (onions) and then in the second plate, sijha kancha kadali bara (mashed boiled plantain dipped in a batter of gram flour and shallow-fried) and kakharu phula bara (pumpkin flower dipped in a batter of gram flour and shallow-fried). 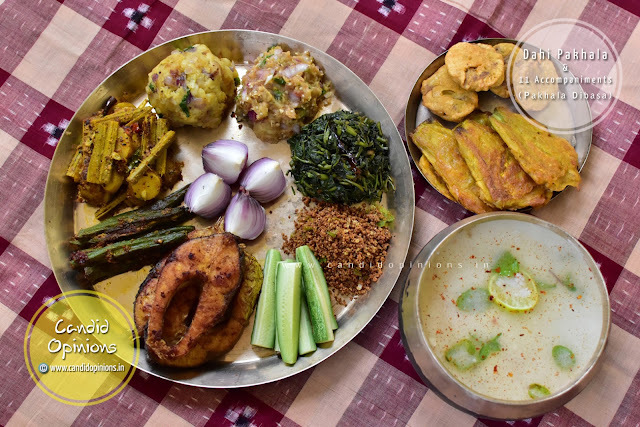 Pakhala is consumed by the people of the state all through the year but during the summer months, it becomes an indispensable part of their menu in almost every Odia family. When the temperature starts soaring to extreme levels draining one of his/her energy, Pakhala is what every Odia yearns for. It is the ultimate rejuvenator and one of the sure shot ways to keep oneself hydrated and thus safe from potentially-fatal heat strokes and nausea during summer. Pakhala is even more popular among the agrarian communities. After a long, grueling day in the fields under the sun, probably the only thing that an Odia peasant craves for after returning home is a bowl of Pakhala - nothing can be more filling and refreshing. The term Pakhala is derived from the Pali word pakhaliba as well as Sanskrit word Prakshalana which means washed/to wash with water. Paddy being the principal crop of Odisha, rice is therefore the staple food of the people here. This humble dish was probably conceived when someone added water to the left over rice and let it to ferment all through the night. Traditionally Pakhala used to be served in vessels made of Kansa metal. Kansa metal is believed to possess inherent therapeutic properties and so eating food in such vessels apparently helps in preventing gastric ailments and other disorders. The procedure for preparing Pakhala is extremely easy. After sufficient water has been added to the vessel containing cooked rice, the rice is left to soak overnight. One can also enhance its flavour by adding crushed raw-mango flavoured ginger (or "amba kashi ada" that tastes somewhat like raw mangoes), crushed curry leaves, grounded green chillies and powdered mixture of dry roasted cumin seeds and red chillies. The liquid part of the Pakhala, known as "torani", is even more sought after as it acts as a wonderful coolant during summers. Even at the Puri Jagannath temple, the "tanka torani" (the liquid portion of the pakhala prepared from the mahaprasad rice, to which curd is added and then given a tempering of crushed lemon leaves, crushed ginger, crushed green chillies and salt) is immensely popular among the devotees. Dahi Pakhala - Dahi or curd is added to the fermented rice. Jeera Pakhala - Dry roasted cumin seeds are grounded roughly and then added to the pakhala. Saja Pakhala - The pakhala that is prepared by instantly adding water to the freshly cooked rice. Baasi Pakhala - The Pakhala that is prepared by adding water to the cooked rice and letting it to ferment all night. So next time when you have left over rice, do not throw it away. Instead all you have to do is to soak the rice overnight in an earthen clay pot, resulting in rice getting fermented by the next morning.Tadaaa... your Pakhaala is ready. Very nicely presented and a wonderful write up. I had eaten Pakhala quite a number of times with my friends during my hostel stay in Bhubaneswar and had thoroughly enjoyed it. Initially I was hesitant as I had no idea about how to eat with hands but once my freiends taught me the way, it became very easy. I must say, this simple Odiya dish made me its fan, it's so very different and unique! Although I am not being able to recognize most of the dishes (Pardon my ignorance) but it does look quite an interesting and alluring spread. Fantastic. Both the photos as well as the article, it was a pleasure reading it. If you permit, can I share this on my FB wall and few other groups? Thank you, Himanshu :) Yes, of course, go ahead, you can surely share this article, no problem at all.